Spread the chocolate evenly over the parchment. immediately add the pretzel twists over the top (it's ok if they overlap!) and gently press them into the chocolate. 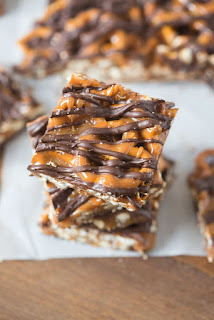 0 Response to "Salted Chocolate and Caramel Pretzel Bars"